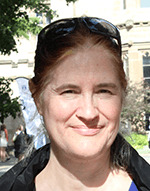 Margaret Reid has pioneered work on new, fundamental tests of quantum theory with her innovative development of inferred Heisenberg inequalities. This work directly inspired the first experimental demonstration of the Einstein-Podolsky-Rosen (EPR) paradox in its original, continuous variable form. Her EPR ideas have led to many subsequent developments in quantum information, ranging from new forms of cryptography to demonstrations of quantum teleportation. More recently she has worked on macroscopic tests of quantum mechanics, which are relevant not just to quantum optics, but also to emerging fields of quantum science including ultra-cold atomic physics and nano-mechanical oscillators.